Edgar O. "Eddie" Brown, 76, of Junction City, passed away on March 16, 2019 at his home. Cremation has been chosen. Visitation will be held Thursday, March 21, 2019, from 6:00 pm. to 8:00 pm. at Mass-Hinitt Funeral Chapel, 805 Caroline Ave, Junction City, KS 66441. Graveside Inurnment will be held 11:00 am, Saturday, March 23, 2019 at The Garnett Cemetery, Garnett, KS. Memorials are suggested to the American Lung Association, National Direct Response Headquarters, 1200 Hosford Street, Suite 101, Hudson, WI 54016-9316, online at www.lung.org or by phone 1-800-LUNGUSA. He was born on May 10, 1942, Garnett, Kansas to William and LaVona (Smith) Brown. He graduated high school in Garnett, Kansas. 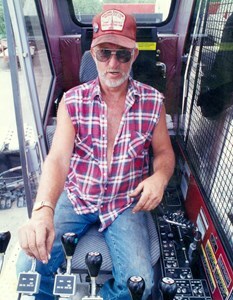 Eddie worked as a crane operator with Building Erection Services Co. in Kansas City, MO for many years. He was a member of the Local #101 and the First Christian Church, of Junction City. On November 15, 1985 he married Benedikta Paddock, in Junction City, Kansas. Edgar is survived by his loving wife, Benedikta, sons, Jess Brown of Emporia, KS, Steve Brown of Emporia, KS; daughters, Dena (Rick) Gardner of Osage City, KS, Mary Brown of Liberty, MO; step-son, John (Pamela) Paddock of Graham, WA; step-daughters, Margret Paddock of Manhattan, KS, Debra Paddock of Jacksonville, FL; sister, Jessie Kay Wycoff of Fort Worth, TX; and 4 grandchildren. He was preceded in death by his father, William A. Brown, mother, LaVona Brown, and brother, Clyde Brown. Mass-Hinitt Funeral Chapel of Junction City, has been entrusted with arrangements. Add your memories to the guest book of Edgar Brown. EDDIE WAS A NEXT DOOR NEIGHBOR, GRADE SCHOOL CLASSMATE, GARNETT CLASS OF 1960 CLASSMATE/GRADUATE AND A FRIEND THAT I SHARE MANY GOOD MEMORIES WITH. HE WAS ALWAYS GREAT ABOUT ATTENDING CLASS REUNIONS AND IT WAS NOT UNUSUAL FOR HIM TO RIDE TO GARNETT ON HIS MOTORCYCLE AND LOOK UP FRIENDS JUST TO KEEP IN TOUCH. FOREVER A PART OF CLASS OF 60 HISTORY. "Eddie, even though you are gone you will never be forgotten!"